7.8", 2014, Look who's turning 30! Muffy Vanderbear is celebrating a milestone birthday in 2014 - and Steiff is joining the fun! To mark this momentous occasion, Muffy creator Barbara Isenberg has designed an all-new ensemble for the character - exclusively for Steiff. 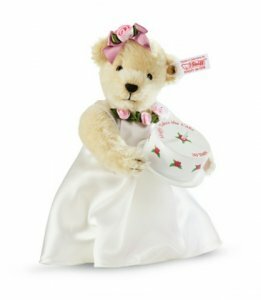 "Muffy® Takes the Cake: 30th Anniversary from Steiff" is a must-have edition for every Muffy® collector and fan. This commemorative edition features a blond mohair Muffy in a lovely white party dress trimmed in pink ribbon rosettes at the neckline and in her hair. The set also includes a customized, cold-cast resin birthday cake, safety eyes, fully jointed. Muffy®/Muffy VanderBear® are registered trademarks of North American Bear Co., Inc.
© 2014 North American Bear Co., Inc.